Christmas is just a week away and we couldn’t be more excited. So why don’t we start with and early celebration? Don’t worry, we are going to bring in the inspiration, fun, and creative projects, and all you have to do is show up. So why don’t we start right now and introduce you to today’s article, which we think will have a wonderful impact on your holiday spirit. Thus, we begin by taking a moment and thinking about one of the most important elements of the winter holidays. The good old Christmas tree. As we all know, it is one of the most significant and beloved symbols of this holiday. Therefore, it is only appropriate that we pay it the proper respect and attention that it deserves. Plus, who can truly say that they haven’t had fun during the wonderful tradition of decorating it? As a child or as an adult, the Christmas tree is what brings us together even before the holidays. But enough about that. Let’s get on with the real reason for which you all are here. The decorations and how you can get to have them. It just takes a little reading, a few materials, and an open mind. And there you have it, the recipe for the most unique and spectacular Christmas tree. We start off with a fun idea of reusing Popsicle sticks to make this adorable sled ornament. Add a little more decoration, if you wish, or just leave it like that and it will still be the star of your tree. If you’d rather stick with the traditional globes for your tree this year, then try shaking things up a bit. A little glitter and calligraphy might be just the unique factor that you were looking for. You may even want to try and giving your tree a few little buddies to spend his time with. With this easy and very creative idea both you and your tree will end up very happy this year. It’s time to learn that wreaths are not just for your doors. 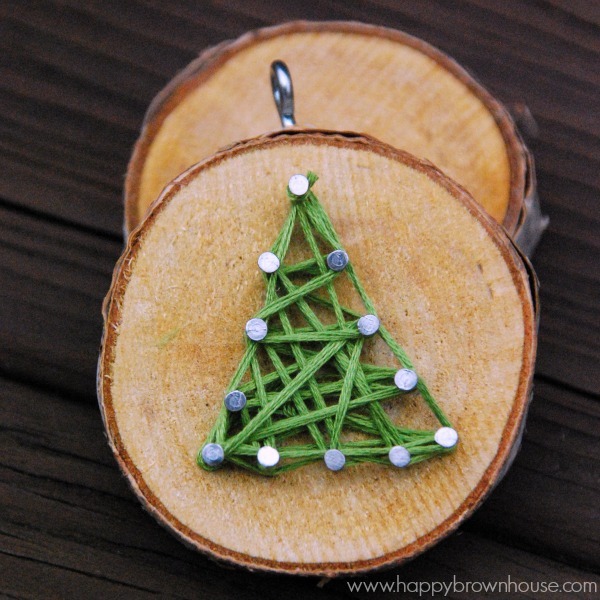 Here is how you can make a miniature version and use them as beautiful and simple ornaments. You can even make them in a large number of colors or patterns and even add your prefered decorations. This one is a more down to earth, if you’ll allow me this pun, ornament. On a solid piece of wood have some with with a bit of nail art. And if you’re not familiar with the concept, don’t worry. You will catch up as fast as you can say string! We also thought that some of you may want to have more of a personal Christmas this year. And in order to help you out, we found this lovely and personal way to decorate your tree by using photos of your loved ones. Let these stars shine in your tree. And you tree shine bright with stars hanging by its branches. These two will complement each other and make for a very lovely combination. Here’s a more unique and eccentric decoration to add to your collection this year. But don’t just skip over it. It can end up as your favorite project. And your children are sure to love doing these. With a wine cork, a few wooden balls, and a few pieces of string you can end up with these lovely angels to guard your tree and family for the holidays. If you have been good and recycled your glass bottles all year, then here’s one for you. With just a few bottle caps you can end up with these lovely snowmen inside your home. And I promise these won’t bring in the outside cold.